Before last year’s Super Bowl Halftime Show, which featured Justin Timberlake doing a tribute to Prince and running through the stands, the general discourse was about making sure nobody got too excited. We knew Timberlake wouldn’t offer an apology to Janet Jackson and we knew he wouldn’t be reuniting with NSYNC, so when it came time for the actual performance we knew it would be a good time to use the bathroom or get some more football snacks. This year, the lead-up to the Halftime Show has been less about managing expectations and more about finding anyone willing to take the stage while so many artists have openly turned down offers to do the show out of respect for Colin Kaepernick—who has accused the NFL of blacklisting him for his political protests. Plus, there was this whole other thing going on where the internet wanted to see a tribute to recently deceased SpongeBob SquarePants creator Stephen Hillenburg. The NFL eventually landed on Maroon 5, with Travis Scott and Big Boi agreeing to show up, and during tonight’s performance halfway through Super Bowl LIII, they actually did the thing everybody wanted them to do. Oh, they didn’t kneel or give a shoutout to Kaepernick, but they did do the SpongeBob thing... sort of. The show started, as these things often do, with Maroon 5 doing a career retrospective medley, playing all of those “oh yeah, I remember this song” hits that fans probably love, before cutting to Squidward from SpongeBob as he introduced Scott, who crashed into the stadium in a cartoon meteor? And then performed a song that had nothing to do with the SpongeBob intro? It was weird, but hey, they did the SpongeBob reference (even if they didn’t actually do the SpongeBob song that everybody wanted to hear). After some more Maroon 5 stuff, Big Boi came out wearing a huge fur coat and riding in the back of car (as Big Boi does), and he actually had the gall to do an Outkast song alongside Adam Levine, prompting millions of people all over the world to simultaneously ask why the NFL didn’t just get Andre and do a full Outkast reunion instead of Maroon 5. Then, after another Maroon 5 song, it... ended. 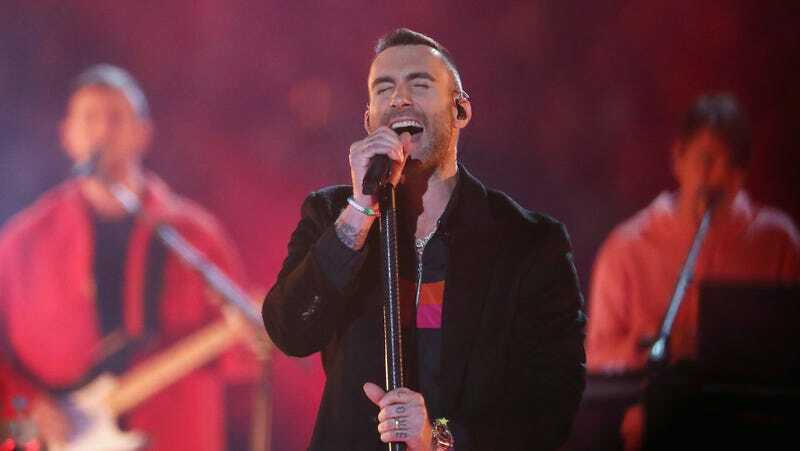 It all felt exactly like the sort of halftime show that was compiled as quickly as possible and after a bunch of other people had already said no, without any central theme or aesthetic beyond the existence of Maroon 5 and Adam Levine’s big “California” tattoo.